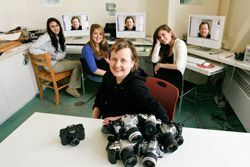 The visual and performing arts programs at Groton provide students with opportunities to discover their talents, to acquire skills necessary for artistic expression, and to develop an understanding and appreciation of the arts. Drawing a landscape, directing a play, or building a mahogany table are as intrinsic to the artistic process as learning to critique a photograph, practicing a cello sonata, evaluating a theatrical performance, or singing a major choral work. Students have opportunities to explore coursework in dance, drama, music, studio arts, and woodworking. They can also participate in the theater program as part of the school’s afternoon activities. A hands-on approach to learning lies at the core of Groton’s arts requirement, which emphasizes the value of being actively engaged in a creative process. Binding together the diversity of the department is the conviction that the arts provide essential opportunities for people to express themselves, to become more perceptive, to develop self-discipline, and to enjoy fulfilling lives. 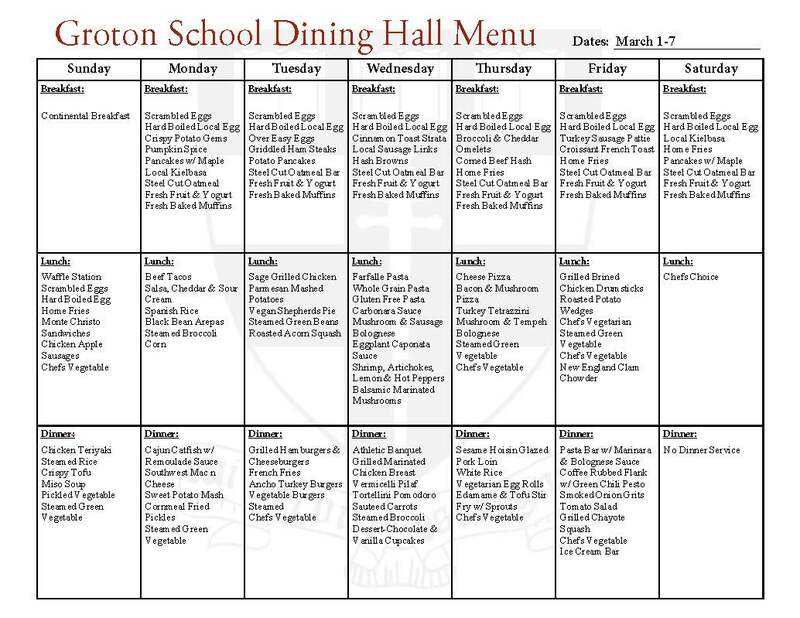 For more information on the arts at Groton School, visit our arts pages. To reserve/purchase tickets to theatrical performances, visit our box office. Requirements​: All students entering Groton in third form take a half-credit, year-long arts course in music, woodshop, or visual arts. All students are required to take three credits of art in any discipline(s) in the Upper School. Musicking does not fulfill the arts requirement. Monika Andersson joined the Groton faculty in 2000. Her roles at Groton include but are not limited to teaching photography and video and curating the de Menil Gallery. Monika’s work has been showcased in exhibitions at various schools and museums, seeing the walls of galleries from Massachusetts to Guangzhou, China. In 2000, her photography was included in the show “Open Ends” at the Museum of Modern Art in New York City. In 1987, a Life magazine contest for young photographers selected Monika as one of the eight best photographers in the U.S. under 30. Monika holds a BFA from the Massachusetts College of Art and an MFA from the Yale University School of Art and lives in Concord, MA. Douglas Brown, teacher of woodworking, graduated from Groton in 1957 and from Harvard in 1961. From 1961 to 1970, he worked with a small pipe organ-building company in Gloucester, MA. 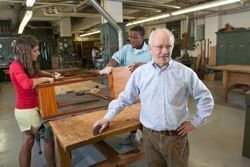 Since returning in 1970 to the School, he has taught all the woodworking courses, chaired the Arts Department for 19 years, edited the Groton School Quarterly for six years, and has been school archivist for more than 30 years. A first generation Dominican-American educator, Melissa is passionate about teaching culturally relevant curricula that create meaningful dialogue and explore complex issues, thereby promoting learning and critical thinking. She believes that education has immense power to liberate, and her lessons strive to empower students by improving their agency, voice, and their ability to express themselves about everyday issues through art. Melissa attended the Fashion Institute of Technology and received her BFA and MS in art and design education, with honors, from Pratt Institute. A five-time recipient of the Pratt Presidential Merit Award, two-time recipient of the Black Alumni of Pratt Award, and graduate recipient of the Outstanding Merit Award, Melissa was trained in a diverse range of art mediums and has integrated them into K–12 classrooms in New York City public schools. Melissa works in mediums and styles that include drawing, painting, fashion design, jewelry design, sculpture, and ceramics. In addition to her classroom experience, she served as an artist-in-residence for Cope NYC’s “Reduce, Reuse, Recycle and the 4th R Re-imagine Project.” As a Fellow for the Center for Art, Design, and Community Engagement K-12, she taught an after-school art portfolio prep class to seventh and eighth graders aimed at helping students enter top art high schools in the New York Metro area. Melissa is fluent in Spanish, loves to dance salsa, visit museums, read, and travel. Jennifer Ho teaches visual arts and co-directs the Christopher Brodigan Gallery. She graduated from UMass Amherst in 2014 with a BFA in Studio Arts (Printmaking) and a minor in education. She continued her interest in art education as an art studio teacher at a preschool in Hingham, MA for two years, where she received an award for Excellence in Care and Education. In May 2018, Jennifer completed her MAT at MassArt, with two graduate teaching assistantships and an honorary internship at Boston Arts Academy; she was awarded the Book Award for the outstanding graduate in her department. Jennifer was born in Hartford, CT and grew up for fifteen years in Singapore, where she attended an international high school before transitioning to Massachusetts for college. She has traveled all across the world, including countries such as New Zealand, China, Thailand, Turkey, Vietnam, Sweden, and many more. In her free time, she enjoys exploring new territories and hidden gems around the city, relaxing with her dog Bubbles, and spending time with family and friends spread out across New England. Organist and Director of Choral Music Dan Moriarty came to Groton from St. Stephen’s Church in Richmond, VA, and Church of the Redeemer in Bryn Mawr, PA, where he was music director. Previously, he was the associate organist and founding director of the Boy and Girl Choristers at St. Bartholomew’s Church in New York City. In addition to his choral and organ work, Dan also directs the music for Groton School's musical. Dan graduated from the Curtis Institute of Music with an Artist's Diploma in organ performance and from Villanova University with a B.A. in English. Dan and his wife, Christina, have two daughters, Charlotte and Ellen. Before becoming the director of Groton’s Theater Department in 2008, Laurie Sales spent three years as assistant director of education at the McCarter Theatre in Princeton, NJ. During this time, she wrote Lucky Girl, a piece of educational theater and a touring production, which explored the topic of domestic violence. Laurie has worked at the Tectonic Theatre Company alongside Moises Kaufman, the legendary playwright and director. Her work has earned many awards and honors in the field of writing and directing. Her play, As Far As We Know, which was performed in the NY Fringe Festival and the Encore Series, earned five stars in the publication Time Out NY. Laurie has a BS from Northwestern University and was a professional director at University of Washington. At Groton, Laurie directs three mainstage shows and teaches courses in writing, public speaking, playwriting, theater, and the creative process. She is a head of Sales’ Dorm, an Upper School boys dorm; a Choices leader; and leader of global service trips, which run in conjunction with the World Leadership School. When she can find the time, Laurie enjoys photography, travel, four-legged friends, and various service opportunities.